Family allowance supports are often provided for employees and individuals who are in need of financial aid for their households. However, one must be able to complete a type of form and submit it along with other legal forms and documents which will prove every claim and information he is disclosing. What Is a Family Allowance Form? Family allowance forms are documents which are provided for individuals who want to be a beneficiary of a family allowance program which is often offered by companies and organizations. These forms are significantly used during the application period as well as for claiming the allowances during the payment period scheduled by the sponsors or the beneficiary program organizers. Moreover, there are also family allowance forms which are only permitted to be used for legal concerns especially for claiming a portion of a deceased family member’s estate which will be provided to the deceased’ living spouse and family members. Just like other financial forms and documents, a family allowance form also has varieties which differ on the preferences and needs of the organization who will be collecting the form from their document users. 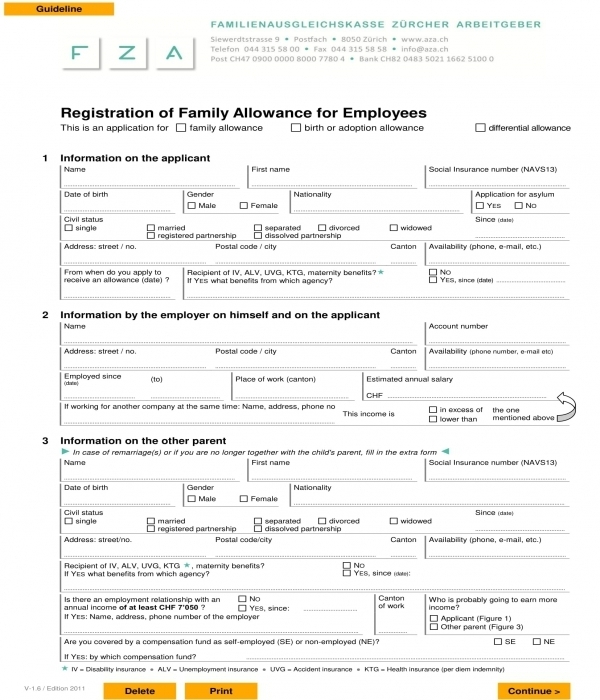 Employee Family Allowance Registration Form – This variety of family allowance form is specifically created for employees and self-employed individuals who are earning within the wage requirement of the country’s family allowance support eligibility. There are seven sections in this form which should be completed by the registrant. The first section of the form centers on gathering the registrant or the applicant’s general information which collects his first and last name, social insurance number, date of birth, gender, as well as his civil status, nationality, and residential address. The second section of the form is allotted for the applicant’s employer and work information which should state the name of the company where the applicant is working, the number of years when the applicant was hired in the company, and the applicant’s estimated annual salary. The third section of the form is where only a particular category of applicants are required to complete the fields specifically those applicants who have been into a remarriage or have been in more than one marriages. This is where the applicant will be disclosing the information of his children’s other parent or his previous spouse whom he got into a divorce as well as any type of marriage separation. Moreover, the fourth section of the form will enlist the names of the applicant’s children who are between the ages of twenty-five years and below. The names of the applicant’s children, their dates of births, the relationship of each child with the applicant, and the children’s genders are all needed to be specified. An accompanying subsection is also required to be filled out by the applicant where his children’s educational background is indicated. In the fifth section of the form, the applicant will be presented with a question which will further determine his eligibility for the allowance as to whether there is another person who is a member of his family receiving another type of allowance support or not. Additionally, the sixth and seventh sections of the form are allotted for important notes and requirements for the applicant. 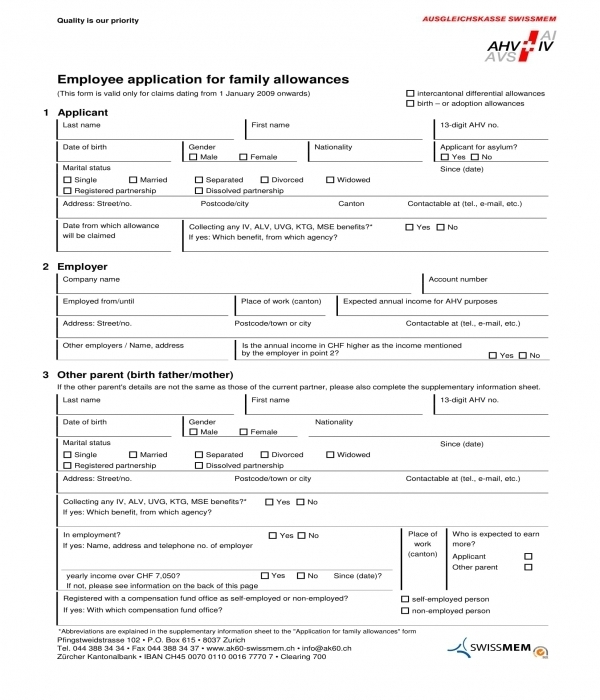 Family Allowance Apportionment Application Form – This document is applicable to be used for individuals whose aim is to divide family allowance amounts. The form will enlist the names of the claimant’s minor children along with their addresses and dates of births. Then, the court will have to complete the rest of the form with the signature of the probate judge. 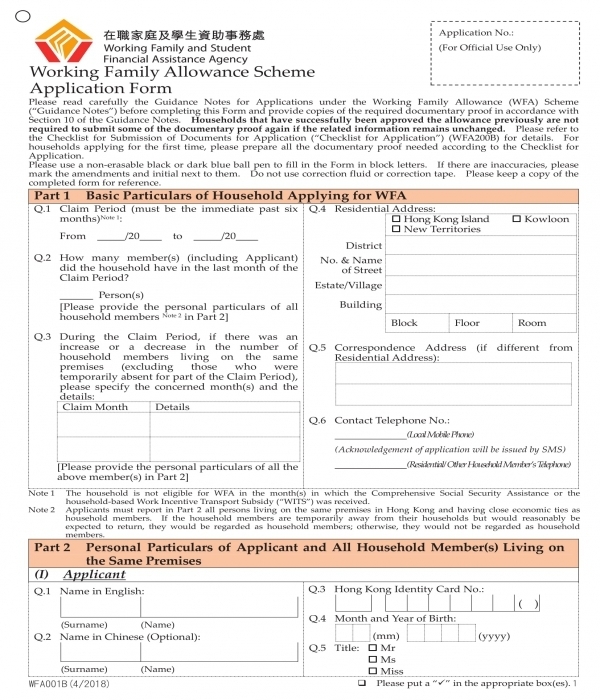 Working Family Allowance Scheme Application Form – Compared to the aforementioned form examples, this document does not only focus on the applicant or the claimant but also the capabilities and contributions of the other members of his household. In the form, the claimant will be presented with six parts or sections. In the first part, the claimant will have to state the basic particulars of his household including his address and contact information. Then, the claimant will have to disclose his personal information in the second part of the form ranging from his name up to his bank account details. The list of all household members living with the claimant is also included in the second part as well as their birth dates and ages. The part three of the form highlights the claimant’s and his household’s income details while the form’s fourth part is where the claimant will state the details of other allowances that they are receiving in the household such as student allowances and employment allowances. In the fifth part, the claimant will have to disclose the information of his household assets while the sixth part is where the claimant will have to affix his signature for a declaration. The examples stated above are just some of the basic and known varieties of family allowance forms that organizations. Nonetheless, there are still other varieties which can be considered to be used, however the most important is that the organization will be able to communicate with their clients and keep their clients’ information confidential and private at all times. 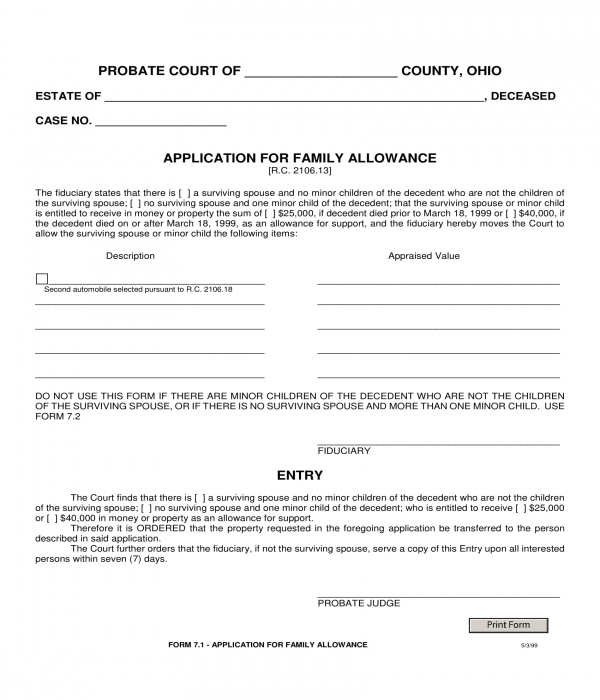 Details of the probate court – This section of the form will indicate the particulars of the court such as the name and address of the court as well as the assigned case number that the court provided for the allowance form which will be filled out. Eligibility statement – This is where the claimant of the family allowance will be able to state his eligibility for the claim for his relationship with the deceased and the value or amount that he is claiming from the deceased’s owned estate property for his allowance support. Description and appraised value – This section is where the claimant will be enlisting the properties of the deceased family member along with its individual appraised market value. 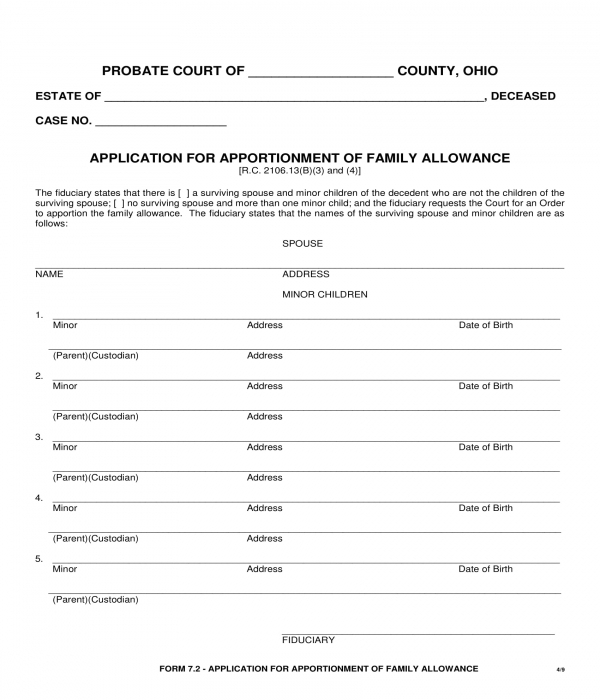 Entry – This is the last section of the legal family allowance form which contains the decision of the court and the signature of the probate judge. However, even if the claimant is the spouse of the deceased property owner, he should still determine his eligibility as to whether he meets the requirement of the State regarding claiming family allowances or not. In addition, there are States who do not approve claimants whose deceased family members have other children outside the marital union as well as those who have more than one minor child in the family. Simplicity and conciseness are two important factors to consider. When it comes to making any type of document, especially those which will be used for legal proceedings, the layout and the format of the document should be kept simple and understandable. The simplicity of the font to be used for the document’s texts must not only be clear but should also vary in sizes depending on where it is used within the document. The variation of sizes will allow the user to know which among the parts or portions of the form is considered as the main section and which is a sub-section where there may be optional contents to fill in. Just like the role of font styles and sizes, labels must be highlighted in the form along with a set of instructions on how the user can complete the form as well as what requirements should be submitted along with the completed allowance form. Include a personal information collection agreement statement. A personal information collection agreement statement is essential for informing the user of the form that the details and all pieces of data and information that he is supplying in the document will be used for family allowance-related procedures. In addition to this, a confidentiality agreement can also be included which is significant for assuring the users that third parties will not be allowed to obtain nor use their information for other intents and purposes without their prior consent or permission. With the aforementioned tips in creating family allowance forms, organizations will have an assurance that they are providing an effective document to their clients and that they will be receiving ample data and information about their client which will be used for processing whatever request and claims the client is needed. How to Fill Out Financial Aid Forms?